Extended press nip solutions combined with steel belts deliver increased press time for greater productivity and a higher quality end product. The key advantages of extended pressure time are the ability to increase press speeds – and therefore productivity – and enhanced pressure control for a higher quality, more consistent end product. The longer press phase allows the pressure to be reduced compared with other processes, eliminating the risk of unwanted reduction in the thickness of the base material. 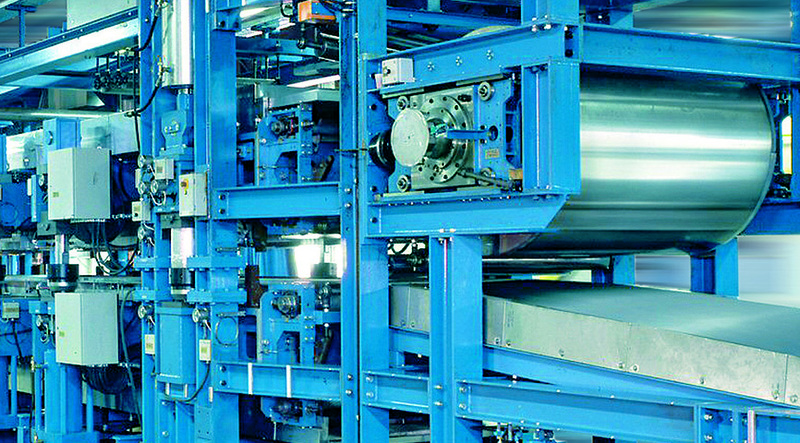 of a IPCO steel belt mean that the benefits of the extended press nip can be realised in combination with in-line heating and/or cooling phases used to transfer heat to or from the product being processed. As a world leader in steel belt process technology, we design, manufacture and install steel belts and associated systems across a wide range of industries, working closely with machine builders and end users. We also manufacture a range of specialised double belt press systems of our own. This experience means we can design extended steel belt press nip solutions for virtually any application, and can upgrade existing single roll nip processes to a more productive, more controllable extended press nip system.